I Mustache You to Measure! SWBAT measure objects to the nearest millimeter and nearest centimeter and write to the nearest centimeter in fraction and decimal form. For this warm up I wanted to give students an opportunity to use the knowledge gained yesterday and get student's mentally ready for today's lesson. Ben is 140 cm tall. Mike is 1040 millimeters tall. Who is taller? How much taller? I direct students to solve the problem about Ben and Mike and their height differences. While yesterday's lesson did not have students measure with millimeters, I can use this warm up activity as an informal check for understanding to identify students that retained yesterdays information about the relationship between centimeters and millimeters. Students solve this problem in their math notebooks. They have access to centimeter rulers as well as the centimeter cubes that we used in the previous lesson. From past experience, I know that some students just need a quick visual reminder to get themselves "unstuck" and on the path to finding solutions. Students know they are able to use the tools when needed. After about 5 minutes, I ask students to share the answer with their learning partner. Then I ask students to share with the class what they think the answer is. We spend another 7 minutes talking about what operations students chose to use to solve this problem. For this part of the lesson, it is important that the students who did not reach an answer hear from their classmates about HOW the classmate solved the problem. This math talk is an important part of this warm up to help all students clarify and deepen their understanding of metric conversions. This lesson plays on the famous mustache craze. Yes, even fourth graders are sporting t-shirts and lunch boxes with mustaches all over them. I begin this lesson by asking students to create a mustache. 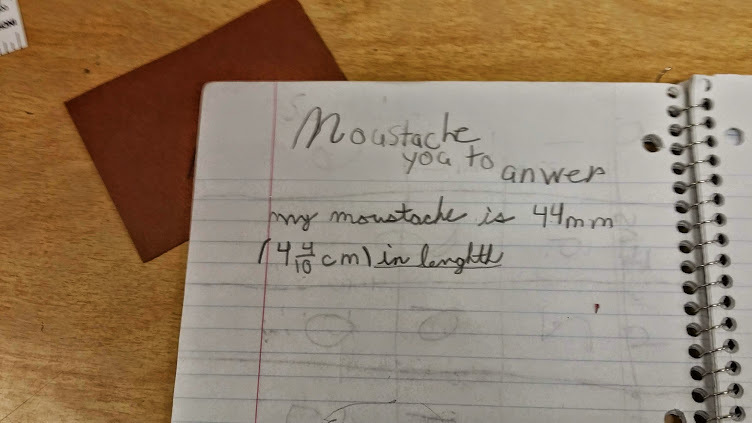 I am not specific on the length, size, or kind of mustache students draw, I only ask they they be able to cut the mustache out. Giving students choice is such a powerful engagement strategy and by allowing students to create their own mustaches, they feel empowered and have choice in how their mustache will look. After students have completed and cut out their mustache, I direct them to measure their mustache to the nearest tenth of a centimeter. This leads to some discussion about what 1/10 or 2/10 of a centimeter is. Using knowledge from yesterday's lesson, students should be able to remember that 1/10 of a centimeter would be 1 millimeter. Before students begin measuring, I spend quite a bit of time reviewing how to measure with rulers. One thing I point out is that the ruler end isn't necessarily zero. I tell students that one way to be more precise and accurate is to use tools correctly. (MP.6) Many of my students also come to fourth grade with the idea that "zero" is always the end of the ruler You can see in the photo below an example of the rulers my students use and how they must start at the first line, not the end of the ruler in order to be precise and accurate. Another tip I teach students at this time is how to use another straight edge, like a piece of paper, in order to tell exactly what millimeter the mustache is in length. You can see in this photo example below, the black paper helps a student see that the mustache is 105 millimeters or 10.5 centimeters. As students measure and record their mustaches, I circulate around the room to assist with measuring as well as make sure students are measuring accurately and precisely. I emphasize that because millimeters are so small, it is very difï¬cult to read a ruler accurately to the nearest millimeter; and it is particularly important to place the ruler carefully along the segment being measured. Students record their measurement in their math notebooks. I then direct students to exchange mustaches with their learning partner and measure the new mustache. Students should check to see if their measurements are the same. At this time, students also check with their learning partner to see if they agree that the millimeter and centimeter measurements are accurate. You can see a sample student work below.